Do you love Hot Dogs? If you answered "Yes", you have come to the right place. A good Hot Dog can be a thing of beauty and a stupendous culinary experience, but the Chicago Style Hot Dog has been described as the quintessential Hot Dog. Start with a Vienna Beef hot dog, nestle it in a steamed poppyseed bun and cover it with a wonderful combination of toppings: yellow mustard, bright green relish, fresh chopped onions, juicy red tomato wedges, a kosher-style pickle spear, a couple of spicy sport peppers and finally, a dash of celery salt. The "Chicago Style" hot dog got its start from street cart hot dog vendors during the hard times of the Great Depression. Money was scarce, but business was booming for these entrepreneurs who offered a delicious hot meal on a bun for only a nickel. 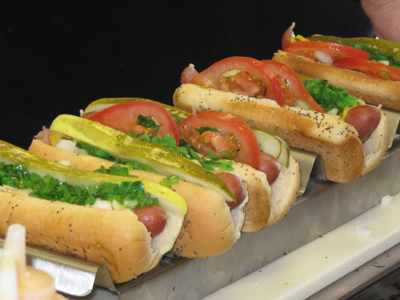 The famous Chicago Style Hot Dog was born! This unique hot dog creation with a "salad on top" and its memorable interplay of hot and cold, crisp and soft, sharp and smooth, became America's original fast food and a true Chicago institution.